While walking along the hallway of the basement-level museum, I stopped to view a large poster of Saul Leiter’s ‘Canopy’ on the dark wall outside the entrance. Sunlight shining down through the centre atrium behind me projected an extra layer of reflections onto the dark void that fills the upper section of that famous image. In that instant, a beam of that light somehow threw open the canopy and transported my consciousness onto the stormy streets below it scurrying along with the others. The organisers clearly aimed to respect the tastes of the local audience in selecting works for this Japanese exhibition tour. 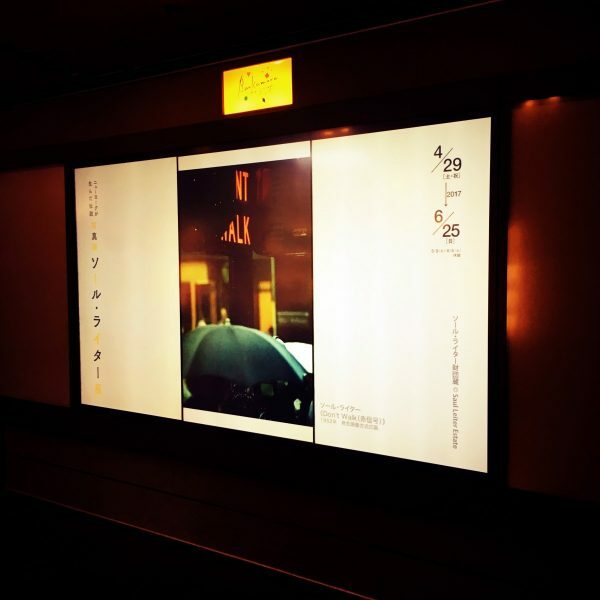 Even the pair of poster images that greet visitors at the door reflect an appreciation of the Japanese affinity with elements such as RAIN, umbrellas, and snow. In terms of composition as well, the posters convey Leiter’s love for ukiyo-e and post-impressionist French paintings also inspired by Japanese art. Photographer Saul Leiter: A Retrospective is a truly comprehensive exhibition, one that fully achieves its goal of offering a deeper look into Saul Leiter’s world over the full span of his career. Visitors walk from area to area as they view separate collections of his work for fashion magazines, his black and white street photographs, his colour street work, his paintings, and his nudes. The large size and superb quality of all the prints further heighten the experience. Additional displays in each area feature personal articles and other items that cast brighter light on Leiter’s life and predilections. Examples include his camera bag with all its gear, a large assortment of his sketches and sketchbooks, and even some of the books on art he collected. Saul Leiter was all about shooting in his natural element and primarily interested in capturing the beauty of given moments. For him, that meant shooting most of his photographs right in the neighbourhood he called home for several decades. As a frequently recurring element in his work, RAIN serves as a vital instrument for amplifying the mood and ephemeral sense of the moment. Of course, with it also come the umbrellas, dark skies, and windows covered in moisture that also help set the stage for many of the magical moments Leiter preserved within the backdrop of New York City’s East Village. If you love the rhythm of the RAIN, its mood, the sense of revitalisation and purification it brings, you will love the exhibition. From Leiter’s soft focus and muted tones to his unique plays on abstraction and focus points, the same ‘ripples’ emanate from his entire body of work. Final word. If you find yourself in Tokyo for any reason before June 25, (and are not completely out of your mind), then do make time for this event! Quotes : All about Saul Leiter ed. May 2017 Seigensha Publishing Inc.
Born in Canada, Alan landed in Tokyo 28 years ago on a two-year research fellowship from the Japanese Government and has been based there since. Alan’s ongoing struggle to make sense of daily life and his environment drives a passion for capturing the mood for given moments. Admittedly fascinated with geometry, form and motion, he is also known for his photographic explorations of “the perpetual sense of slight imbalance (and reflexive correction) that keeps us on our toes”. Alan has employed the iPhone exclusively to capture, process and post all his images since late 2010 as he continues to enjoy exploring depth and scale within the square format. Alan Kastner @wallah was one of 6 iPhoneographers chosen from around the world to be featured in ‘Latitudes International Photography Festival 2012’. Sponsored in part by Magnum Photos, this was the first time iPhoneography was shown at museum level together with renowned photographers, including those from Magnum. Recently: Alan Kastner @wallah was the Winner of the ‘Street’ Category : MoboPhotoFest 2017 and exhibited at the MOJOCON 2017 Mobile Journalism Conference in Galway, Ireland. 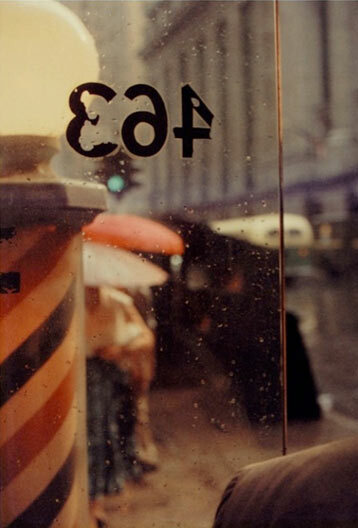 RainStations is enormously grateful to Alan Kastner for taking the time to write this very perceptive and insightful, RAIN focused, Review of Saul Leiter’s work currently exhibited at the Bunkamura, Tokyo, and share his own enthusiasm for RAIN together with that of Saul Leiter’s. It is an Honour. Thank-you so much!